With America’s dwindling attention span — not to mention appetite — for televised awards shows on the decline, Sunday night’s 2019 Grammy Awards, hosted by a radiant Alicia Keys, did not embarrass itself. Advertised tributes to Motown diva Diana Ross and country icon Dolly Parton resonated with the audience but didn’t have much reach outside the TV box. The tireless hype machine surrounding Lady Gaga’s every move did not bring extra eyeballs to the CBS broadcast, either. The overall show, which ran long, scored a 12.8/22 in metered market ratings or 17.645 million viewers. When final numbers are in, those figures should rise. At least vital numbers weren’t down. Last year’s show, hosted by James Corden, came perilously close to the lowest rating CBS has ever received for a Grammys telecast — 19.04 million viewers in 2009. Final numbers for the 2018 extravaganza were 19.81 million viewers or a 5.9/21 rating among adults 18-49. Country singer Kacey Musgraves won four awards, including Album of the Year. Donald Glover alter ego Childish Gambino won four as well. Lady Gaga and Seattle-born singer songwriter Brandi Carlile won three apiece. 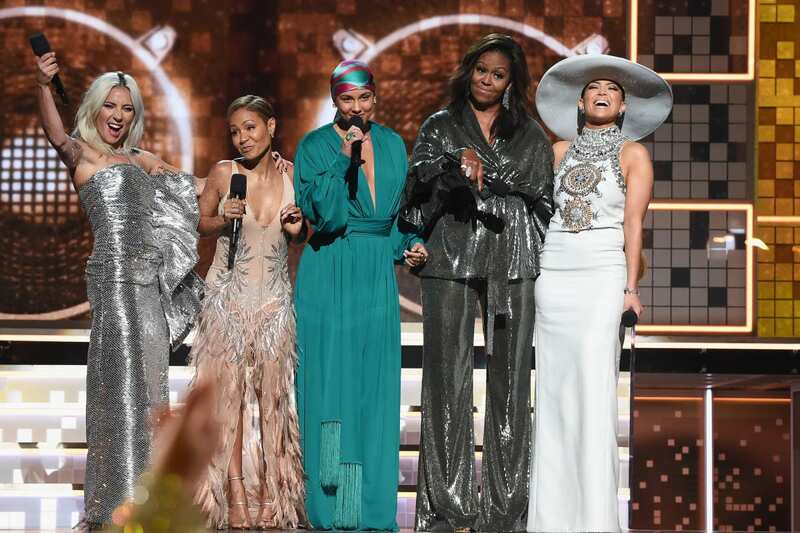 But the night’s most buzzed about moment came early on, when former first lady Michelle Obama showed up on stage with Keys, Gaga, Jada Pinkett Smith and Jennifer Lopez for a segment about the power of music. We need Michelle Obama to tell us that music can help inspire self-empowerment now? It was superfluous and politically motivated.